Scottsdale, AZ, November 1, 2011: Sharon Lechter, best selling author and financial literacy expert was named a Finalist in the Lifetime Achievement category in the 8th annual Stevie Awards for Women in Business. Founder of Pay Your Family First, also a finalist for a Best Company category,Lechter continues to innovate new ways for families to teach financial responsibility globally. 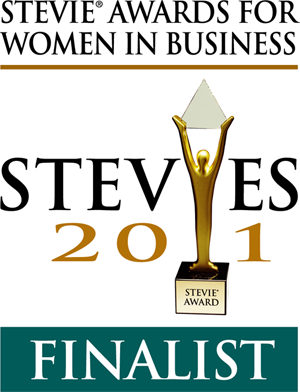 The Stevie Awards for Women in Business honor women executives, entrepreneurs, and the companies they run –worldwide. The Stevie Awards have been hailed as the world’s premier business awards. “I’m honored to stand alongside so many accomplished women nominated for this prestigious award. I hope that this honor sheds light on the importance of financial education as we continue our work to empower families and to inspire children to create financial independence,” said Lechter. Nicknamed the Stevies for the Greek word “crowned,” winners will be announced during a gala event at the Marriott Marquis Hotel in New York on Friday, November 11. Nominated women executives and entrepreneurs from the U.S.A and several other countries are expected to attend. The presentations will be broadcast live on radio in the U.S.A. by the Business TalkRadio Network. More than 1,300 entries – a record for the competition – were submitted this year for consideration in 75 categories, including Best Executive, Best Entrepreneur, Women Helping Women, and Communications Campaign of the Year. Sharon Lechter is a Finalist in the Lifetime Achievement category. Best selling author, entrepreneur, international speaker, CPA, philanthropist and proud mother and grandmother, Sharon Lechter passionately promotes financial literacy for families. A national spokesperson for the AICPA, Lechter also was honored to serve as a member of the first President’s Advisory Council on Financial Literacy. Lechter has received a 2010 Mom’s Choice Gold Award® for her board game, ThriveTime for Teens, as well as a Gold award in 2011 for the YOUTHpreneur BIZkit. Pay Your Family First resources have also been awarded a Dr. Toy award, WTS Toy Review’s 5 Star rating as well as Creative Child Magazine’s 2010 Game of The Year for ThriveTime for Teens. Most recently, she published, Three Feet from Gold and Outwitting the Devil, in cooperation with theNapoleon Hill Foundation. Co-author of the international best selling book, Rich Dad, Poor Dad, Lechter continues to travel the globe empowering others to achieve prosperity. For further information about Sharon Lechter, visit her online at http://www.sharonlechter.com/. To explore Lechter’s games and tools for youth, visit http://www.payyourfamilyfirst.com/. Sponsors and supporters of the 8th annual Stevie Awards for Women in Business (as of October 12) include the Business TalkRadio Network, Coloredge, Infogroup, KeyBank | Key4Women, Melilea International Group of Companies, SDL, and Smart Reader Worldwide.